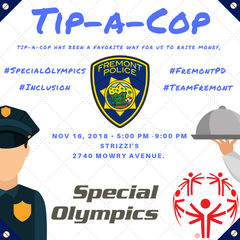 Join members of the Fremont Police Department in support of Special Olympics at the Tip-A-Cop® fundraiser Friday, November 16, 2018, at Strizzi’s Restaurant. Come out and enjoy a great meal served by members of the Fremont Police Department and Special Olympics Athletes. Our staff will be volunteering their time as wait staff helping to deliver food and drinks, with all tips being donated to Special Olympics Northern California. The event raises money to provide local Special Olympic athletes with FREE year round sports training and competition opportunities in 12 different sports. The Fremont Police Department, along with the international law enforcement community, has had a longstanding relationship with the Special Olympics. The Law Enforcement Torch Run® is a year-round fundraising campaign, which culminates with the carrying of the Flame of Hope to Special Olympics competitions. Funds are raised through a variety of activities, including several Tip-A-Cop® events at various local restaurants in our community to help support the event. For more information, or to make a donation to the Northern California Special Olympics, visit www.sonc.org.